The Star of India is the world’s oldest seafaring ship. Originally built in 1863, the Star of India is now a maritime museum docked in San Diego Harbor, and occasionally puts to sea for special sailing events. The Star of India is tied to her dock along the waterfront of San Diego harbor. The Star of India is the worlds oldest seafaring ship. Built in 1863, she is an experimental design of iron rather than wood. She is now a maritime museum docked in San Diego Harbor, and occasionally puts to sea for special sailing events. 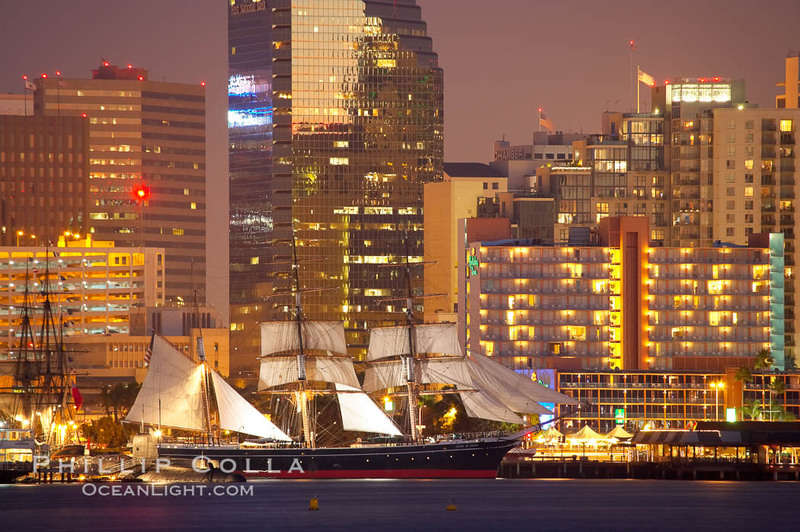 The Star of India under full sail offshore of San Diego. The Star of India is the worlds oldest seafaring ship. Built in 1863, she is an experimental design of iron rather than wood. She is now a maritime museum docked in San Diego Harbor, and occasionally puts to sea for special sailing events. The Star of India was built in 1863 on the Isle of Man at the Ramsey Shipyard in an experimental design that employed iron rather than wood. She originally bore the name Euterpe, named for the Greek goddess of music. The early history of the Euterpe was dramatic. On her first voyage to India she endured both a collision and a mutiny, while her next voyage to India put her in the path of a cyclone from which she barely escaped. Unfortunately, Euterpe’s first caption died on board soon after. Four more voyages to India followed, with no mishaps, before Euterpe was sold to the Shaw Savill company of London in 1871. She spent a quarter century ferrying emigrant travelers, primarily to New Zealand. During this time Euterpe made over 20 circumnavigations of the globe, trips that could last as long as a year. In 1898 Euterpe was sold to new American owners who put her in service from Oakland to the Bering Sea ferrying fishermen north and canned salmon south. 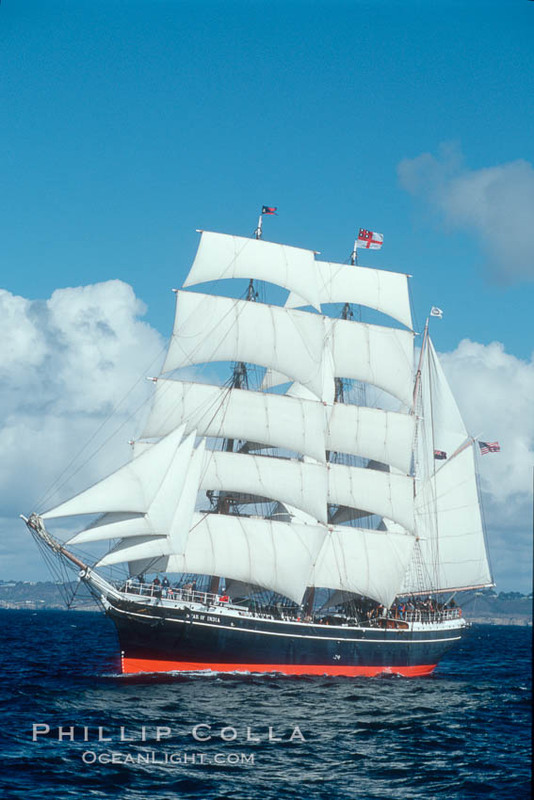 Euterpe was officially renamed Star of India in 1906 by the Alaska Packers Association, and was also rerigged in 1901 from her original full-rigged configuration to her present rigging as a barque. 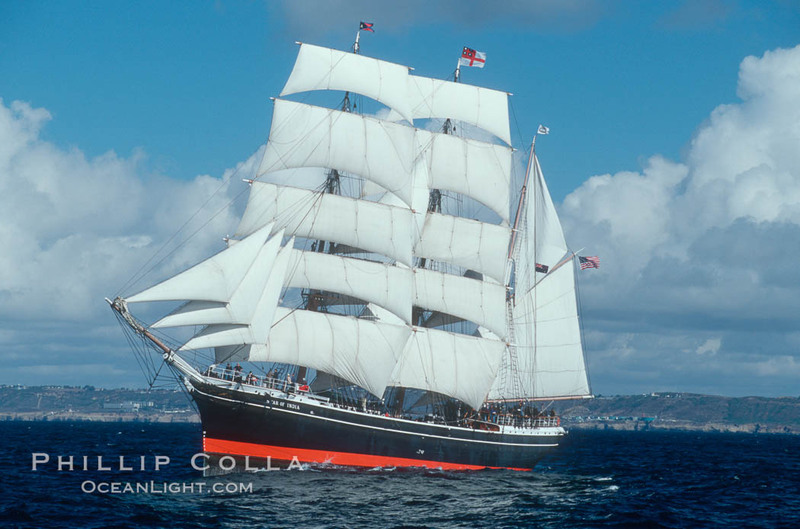 By 1923, large sailing ships were no longer needed, having become obsolete in the face of steamship technology. A group of San Diegans, formed by reporter Jerry MacMullen, purchased the Star of India in 1926 for $9,000 and brought her to San Diego. 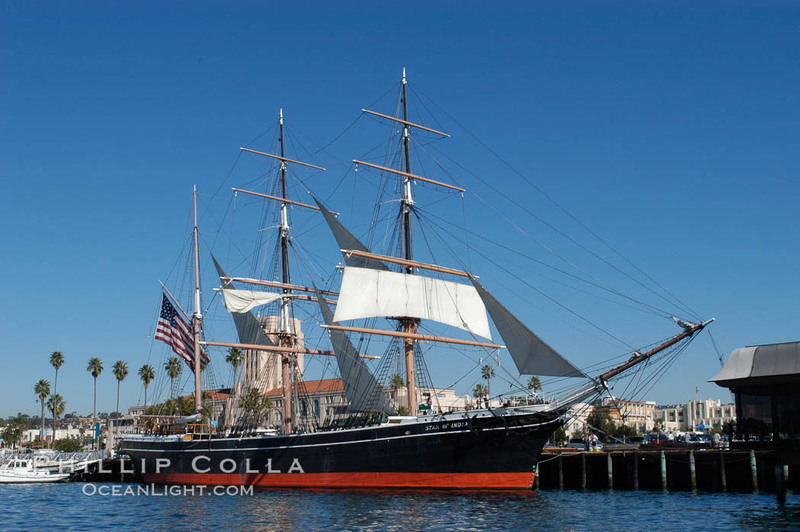 However, the Star of India’s condition deteriorated during the depression and World War II until the late 1950’s, when piecemeal restoration finally began. In 1976 the Star of India, fully restored, went to sea after a hiatus of 50 years. She is now maintained by a crew of enthusiatic volunteers, and sails on the ocean at least each year.